Ever since the substantial breach of our Constitution by the Executive branch, only one political party, Janatha Vimukthi Peramuna (JVP), has been consistent in its action and speech; only one political party, JVP, has been trying to drive home the point that there is no possible compromise between constitutionality and non-constitutionality; there is no compromise between treachery and patriotism and there shouldn’t be any compromise between right and wrong. The Executive committed the first sin: firing of one Prime Minister and replacing him with another who did not have a majority in Parliament; then in order to cover up that sin, the Executive committed the other sin: dissolution of Parliament. As the axiom goes, two wrongs don’t make one right. And added to the confusion of circumstances, is the unfortunate status of the polity of Sri Lanka- a looming anarchy replacing ‘Yahapalanaya’. 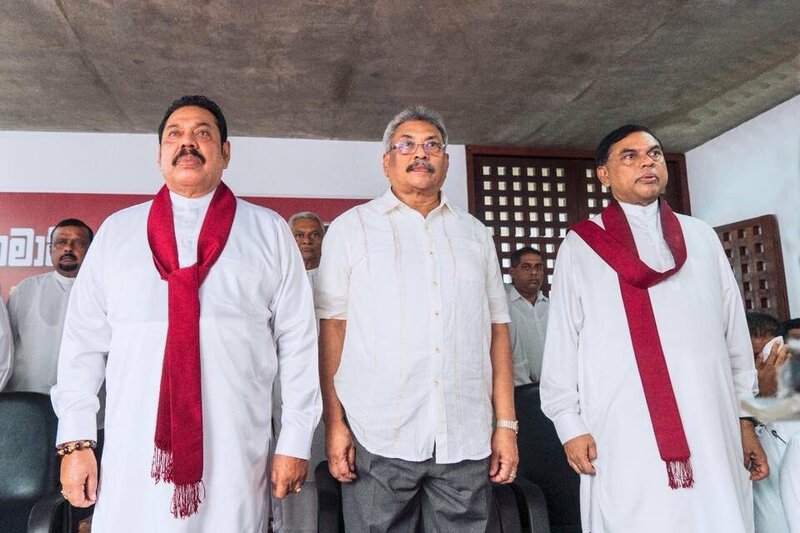 A country, whose innermost commitment to a life and governance of majority rule, in other words Democracy, was being played inside out and upside down to the whims and fancies of just two individuals, the Executive and Mahinda Rajapaksa. One can understand or rather surmise why Mahinda Rajapaksa is so keen to wrest the Premiership away from the then holder Ranil Wickremasinghe. 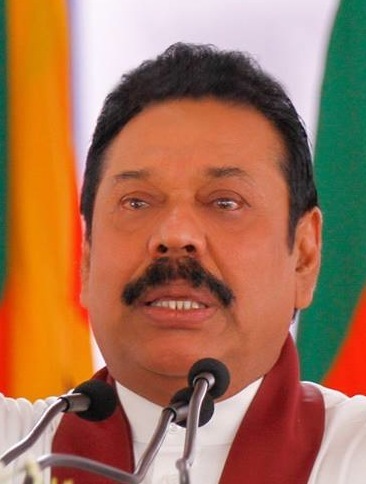 When one holds the wheels of power of government, as was shown during his infamous regime of corruption and greed, Mahinda may have hypothesized that he could approach or even direct the arms of the law in the country not to stretch that far so that he and his family remain unchallenged from that stretch of the law. Unlimited Impunity that he enjoyed in his own regime was the scourge of the decade that spanned from 2005 to 2014. Whole lot of litigation proceedings are pending against the Rajapaksas. Not even Mahinda’s powerful siblings and sons are spared. The lap of luxury and the cushions of power have been removed, not by a decree of the Executive; they were removed by popular vote in the Presidential Elections held on January 8, 2015. What the voter took away from him and his family, Mahinda Rajapaksa was successful in regaining, this time by the power of the Executive in the fading hours of October 26, 2108. With that Executive order, people may have thought, one nail was driven in on the country’s coffin of democracy and the rule of law. Not so. There was the judiciary, the Supreme Court. My previous column made an attempt at explaining the supreme power our Supreme Court has and how that three-bench court arrived at a very sane and rational conclusion to stay the ‘dissolution’ of Parliament which was executed by the Executive of the land on November 9, 2018. That ‘stay order’ was a slap in the face of the Chief Executive, not his office, but his personal self. Carrying out the responsible and burdensome office of the Chief Executive is no mean task. It requires a great deal of political understanding, political tact and political discipline. That poise, grace under pressure, as Earnest Hemmingway most poetically described, is courage. One cannot be described as courageous when one is seen resorting to desperate measures that are outside the confines of the source of the country’s law, its Constitution. These are the real issues that have sprung up from the unprecedented constitutional impasse that has crippled the country’s lingering journey towards her prestigious goals. Resolution of the present constitutional gridlock is easy, if those who control the switches of power intend to resolve the issues. As per reports, if the Executive can withdraw the infamous Gazette notification, a definite comeback from the falsely lofty posture the Executive assumed on November 9, the Executive may well be spared the shame of being found wanting by the Supreme Court. In order to provide a dignified exit for the Executive from the crisis,which the Executive himself created, withdrawal of the said Gazette notification may be cited as an easy and dignified way out. But what must reign supreme are the national interest and continuation of democratic governance and the rule of law. Today even in the remotest hamlet in Sri Lanka, whether in the North or Deep South, along the coastline or in the chilly Hill Country of the land, the people are unequivocally concerned about the rule of law. The rule of law cannot be tampered with, period. A softening of mind and tempering of blind determination is not a weakness of a human being. On the contrary, it is conclusively a positive and rational response to an uncertain and volatile circumstance. Moderation, when taken as a weakness, bends to shameless subordination of principles and core philosophy in life. But if moderation is taken as a calm and sublime response to a hard and inflexible condition, it is highly commendable and praiseworthy. Yet it is a grim test to pass. It is in this unkind environment the Appeal Court of Sri Lanka, on December 3, followed hersuperior, the SupremeCourt. The Appeal Court issued a so-called writ of Quo Warranto on Rajapaksa and his disputed Cabinet of Ministers, requiring him to justify his staying in office in a case to be heard on December 12. As at now, December 4, while doing the finishing touches to this very column, there is no Prime Minister, no Cabinet of Ministers, and no government. The Executive consists of one solitary figure, the President. However, both the Legislature and the Judiciary have chosen the path of right. The Executive has a very easy decision to make. Yet it takes enormous humility and consequently courage to say ‘I’m sorry, I was wrong’. Just six words in English and these words consist of a truly unpretentious and adequate expression of humble submission to the rule of law. If on the other hand, the Executive wishes to trek a more winding and unbecoming path, the destiny of our democracy could be in grave danger, this time not from a demented set of parliamentarians, but from the Chief Executive himself. Expression of personal dislike of one individual, in this case, Ranil Wickremasinghe, is most ‘un-Presidential’. That would be a tragic expression of loss of hope in human tolerance and decency. A nasty end to an imprudent judgment made in a different time could still be averted. A wrong committed under different circumstances could still be righted. Bur resort to delusional processes in a democratic framework is far worse than a well-thought out grabbing of power by a military leader. Whilst all this tragicomedy is being enacted before a docile public, the very foundation of the country’s governing framework is trembling. Seventy years of self-rule is being tested to the hilt. The people’s will is being challenged and their dreams and aspirations are fading. From the mist of this potential doom must rise hope and optimism; from it must rise courage and humility; form this dark cloud must separate a silver lining which is a profound commitment to optimism, to hope and wisdom. There may be many a bright person in our midst, but finding a wise one is most difficult and they are indeed rare and nearing extinction. Indulgence in analytical talk is redundant and infertile. We must first learn not to look beyond the obvious. What is palpable is evading us and there is no reason other than we are refusing to see such palpability. Vishvamithra if your Yahapals had an ounce of brain they could have predicted that My3 would do the same to them as he did to MR in 2014 November. But your overblown egotistical attitude and your empty superiority failed to see that the executive presidency whether held by an Oxonian or a person from Polonnaruwa had the same power. You all thought you could pull a set of strings and the President you elected by spreading lies and innuendo to defeat MR will dance like a puppet, you thought “why wouldn’t he, he is nothing and we are the Elite creme of Colombo seven”, you thought “hey he doesn’t use the fork and knife, so he wouldn’t use the sward of the Executive either”, surprise, the man from Polonnaruwa found his day to bring down that sward on all those who thought he was less of a human being than the ones from yes Colombo 7. They selected Sirisena to lead them on to that nobel destination of Yahapalanaya with an extremely ulterior motive. If Rajapaksa was that evil how his assistant be a Bodhisattva (one destined to become next Buddha) as he was portrayed? It was a dirty political coup. They managed to deceive 6.2m people. A beautiful example of the power of propaganda. he also doesn’t the Rajapakse attire…. you see he is a US citizen …..he is in Sri Lanka to milk the country’s wealth…. Correct. All (sorry, 99%) our politicians start deceiving the masses from the top. Mahinda is like a singahlse Praba.why say this …Praba cost Sri Lanka £200 billion for war . By now Mahnida and his cohort might have cost Sri Lanka more than £100 billion both ways .. Consider for instance mega projects .higher interest to China . 99 years of leave deals ..
All may have exceeded war expenditure or it half of it . Now people should who is real Sri Lankan patriotic and who are not . Your correct ID should be Langan One. The wsy you wrote it, you should be Tamil. Why NOT think of Quantifying How much RANIL / entire UNP , specifically Karu J, Speaker,has COST the country ??? U people never think of the other side U prefer,People are BLIND purposely ??? Look at how U evaluate DEMOCRAzy, Its drmoCRAZY . Just sincerely quantify what RANIL “s govt, has done for the past 8 +38 ,months !!! It is Sinhalese racists and politicians. from the time of independence like the Senanayakes, Bandaranaikes and Rajapakses and a largely racist Sinhalese population fed and brainwashed on the Mahavamsa myth by their elite and politicians, who systematically discriminated and committed all sorts of war crimes on the island’s Tamils , who have the same right to their land as the Sinhalese that gave birth to Pirapakaran . He tried to save the Tamils from this state sponsored Sinhalese racism . He may have become misguided during the latter part but his intentions were good and noble. The LTTE was not the cause of most of the death , carnage and cost to the island , only around 5%. It is the Sinhalese politicians , armed forces and their elite who are responsible for this and are still responsible . They ooze with racism , anti Tamil venom and are very opportunistic and unprincipled . They are still causing all these problems with immense cost to the island. However the Sinhalese largely will not admit to this but try to play the victims and blame others for the misfortune they are causing upon themselves and on others. Trying to compare Pirapakaran to Rajapakse is like comparing apples to oranges. The former was forced to use violence to save his people from state sponsored genocide but failed due to misguided policies , failing the grab opportunities , and international interference , in the end he sacrificed himself and his family. The latter like most Sinhalese politicians is deliberately using violence, racism with immense cost to the country, just to benefit himself and his family. Praba fought for the Tamils…. Mahinda ..didnt fight for the Sinhalease ….but ..fought to line his famils’s bank account now they are the richest political family in Asia …. You are of course discounting the singahlse lives he saved, but they don’t matter it is only money that matters. It was outright free-hold ……. not 99-year lease! It was Ranil who got it down to 99 years in the harbor city. But Ranil has no “charisma,” no! In good ol’ Lanka people will worship you even if you feed them sand ……… if you have charisma and do it with razzmatazz. Centuries ago, there lived a man named Socrates. He was brought before the then Judiciary charged with a series of offenses committed against the “STATE”( including the Society) while being a “Teacher” . He defended himself and in one instance referred to a conversation he had with a “Politician” known and associated. He, said this: ” When I began to try to show that he only thought he was wise and was not rally so, my efforts were resented both by him and many of the others present. However, I reflected as I walked away; Well I am certainly wiser than this man. He thinks that he knows something which he does not know, whereas, I am quite conscious of my ignorance”. When considering the “Death Penalty” that was imposed on that man named “Socrates” , is there any need to reflect upon these “Politicians” who do know what they do not know, and tell them that they are the COURSE of all this misery. Instead, it is better to tell them direct, that they are a CURSE and face any judgement. they are Sri Lanka’s MAFIA…..
MS+RW should have started the Judicial Inquiry in to all the nefarious activities of the Rajapaksa clan. Gone after the stolen wealth of Rajapaksa and his stooges. If they have done ot in 2015 we will not be facing TODAY’S problems. Time to call for the Presidential Election. Time to end the Provincial Councils..Time to limit the number of Cabinet posts in a GoSL. Time to have basic qualifications to contest as MPs PM or President.Time for New Constitution. From the beginning of the Yakkapalanaya project, it was evident that it was founded on lies, deception and conspiracy, but most of all, hype. Those who voted for the current President voted for a proxy UNP candidate. As I often like to point out, the Common Candidate Sirisena ran against the UPFA candidate, against his former party, betraying the mandate placed on him to support and work for the UPFA and the SLFP. Many ministers ‘crossed over’ – now we think it shameful to cross over for money but that was a different time. The project was doomed from the start as an attempt to bring Ranil W into power. It is no surprise that such an endeavor ends up like this – it was predicted by those who voted for ‘Maithri’ – they were deceived, partly by themselves. If you want to call those who ended the war ‘not saviours’ then it is up to you, but it does not reflect reality. If that is the nature of ‘our people’ so be it. Of course you don’t have to break the constitution – just re-write it. Of course the independent judiciary will have to give the decision in favour of one party over the other, but it may not intend to. Oh people! Can’t you rise above labelling each other by race and by religion, for goodness sake! A good number of comments here reveal the prejudice and bigotry of the writers. A good part of the problems we face in this country is because of this attitude of “I’m Sinhala, You’re Tamil”; “I’m the majority, you are the minority;” “I’m a Sinhala Buddhist, you are an Anglican or Hindu”, etc, etc. What a low level of human spiritual evolution you demonstrate! We are all human beings, there is good and bad among all of us. You who represent religions and philosophy which speak of love, compassion and kindness to ALL living beings, do you not stop to think when you make these comments whether you are reflecting the teachings of those religions you profess to follow? Our much boasted about 2500 year old ‘civilization’ becomes a joke in the face of the elementary level of human consciousness displayed by many of the commenters here. We will all die one day and there is no special place for Buddhists or for Hindus or for Christians or Moslems. We don’t carry our man made labels with us. Move up to the next level, people, don’t remain as spiritual Neanderthals! We have a President who has gone mad. There is no legitimate PM. Therefore the Speaker of Parliament who is in-charge of the Parliament which solely has the mandate of the entire country to govern and prevent the country falling into chaos should grab hold of the reign of the country as the ultimate authority by default. Unfortunately he does not have the oomph. Seventy years ago we started with, what was popular at that time, the government of the people by the people for the people. We encountered difficult spots and minor crisis but glossed over with band-aid solutions. We had crisis after crisis. Several band-aids later we have the government of elites by elites for elites. The non-elites get to vote off and on but the elites go on regardless. The purchasing power of the non-elites erode by the day. The elites do not seem to care! There are indications that the RW-sack was a putsch and we have had a coup d’état. The coup has had a set back. We must take necessary actions NOW and make sure there is no repeat. Vishwamithra: Our elites are bad. The elites serve only themselves. Is this the time to look for not-so-bad elite? Man a huge bill of USD 1.5 billion is due middle of January2019, and for the whole of 2019 USD 4 billion is due for payment, and for 2020 USD 6 billions is due for payment. Highest two years in the recorded history of the country for debt payment, when things are like this how they going to meet these obligations, and sure, there going to be huge troubles in the country, if they wouldn’t solve these issues soon. Unfortunately for them, it’s something average Sri Lankans don’t have. Probably they have RW disgust. It’s not easy friends; to change mind set of millions of individuals. The JVP are well known ruthless and violent pawns of dark hidden forces who want to change the Lankan demographics by luring vulnerable Sinhalese youth into rebellion and then decimation by state militias. They have the singular and dark honour of getting over a million Sinhalese men and women killed, maimed and destitute in the 1971 and late 1980s meaningless violence. Their higher carders are in the payment of sinister anti- Lankan, anti-Sinhala forces. No one should be hoodwinked by the most vile and barbaric forces that now masquerade under a constitutional democratic ethos while biding time for the next massacre. The rest of the authors article is a repetition of gibberish that is meaningless. Lankans should ask themselves one question and one question only. Do they think their country has a future under a Ranil Wick the Wimp, low-energy, slow moving, slave of the forces that want to keep the country down so that they can continue status quo to plunder its resources. Or do they want a village idiot of the lowest IQ near retard level such as Sajit, or a man whose time has passed such as Mahendra Rajapaksa? Or, heaven forbid the retard with likely mental defects Namal Rajapaksa? Lankans should say, hell no, we deserve a real leader, a man who can get things done, who can withstand the riposte from sinister forces when inevitable collateral damage results in the course of putting a thorough disorganized population under some level of discipline and towards a path for success. That man is Gotabya, and the others are weaklings, wimps, low IQ morons, and imbeciles who should be in jail , not the parliament. Lankans have a tryst with destiny. The man of the hour is there, Gotaby, and win with him or lose and be a banana republic under above imbeciles. You mean the former National Hangman. By 2050 the global population is estimated to reach 9 billion. As a token of gesture towards population control you want him to reduce the nation’s population to about 2,000 people. It’s like “Turkeys voting for Christmas”. JC. Real load of hog wash.
You mean, the article by Visahwamaitra? Yes, I agree. The three biggest rogues and criminals. What a bunch of scoundrels. The crux of the crisis is not that MR and family or his governances in Island less than 30 days. The root cause of crisis goes to 1977 that Neo-Liberalism of UNP set of policies an introduced by JRJ-Right policies of UNP’s had been surrender national economic sovereignty to foreign -power…multi-nations run by USA, UK EU and Japanese led hegemonies . The very beginning in 1994 that CBK a visionless leader has adopted previous UNP policies into SLFP of set of policy implementation by her leadership. CBK created a political-economic -social casatopre that under her leadership in 11 years misdirected of nation RUIN that until 1994 to 2005. Her political-economy governances without UNP leadership ,that CBK has laid foundation of SLFP as a Neo-Liberal Party. Her that period of mismanaging by CBK role of politics-economy-social in 11 years country has lost that Sustsnsbility development of capitalism. only NOT that agreed for less than they claim only regime political Eealm. But she was ready give large Federalism Tamils in NORTH for that but democratic and national forces inside and out side an opposed such Federal move by majority people of Island. 2 CBK has stand uninterruptedly was on the WAR footing politics ,instead of Peace and Development has been betray by SLFP leadership of CBK. Piyal, my brother, try telling this to our retarded public. Even if you put those figures in numbers adding all the zeroes, Lankans will not get it. I appreciate you and few others who are desperately trying to enlighten the clueless with real facts. The educated fools are busy arguing about the missing zeroes in Hampantota development and bonds.I guess after all these circus they will pick the one with more/ less zeroes.